Published on October 29, 2012 in Homebrew. 0 Comments Tags: baltic porter, extract, Homebrew, Recipe. 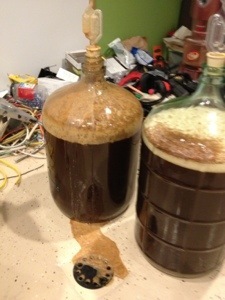 Yesterday, as rain poured down outside the open garage, a Baltic porter was born. A few friends joined to get a refresher in partial mash brewing (extract plus steeping grains). We started the morning with a quick recipe, a trip to Homebrew Exchange (which is open Sundays thankyouverymuch), and got the water heating. I had to do some reading again to remind myself how to do an extract batch, but the savings in setup, time, and cleanup were a nice change of pace. To mix things up, and to get beer a little sooner, we decided to split the beer in two carboys and pitch one with british ale yeast and the other with California lager yeast (2 packs on a recommendation from the shopkeeper). Brew day was easy, and the extra hands around meant that cleanup (and carrying the 6+ gallons for beer to the basement) was much easier. OG came in at 1.087. Get to work yeast! Published on April 27, 2012 in Homebrew. 0 Comments Tags: avocado, Homebrew. I was recently given a homebrew from a coworker. Not an entirely unique thing, but when she said it was brewed with avocado leaves, I was intrigued. It’s a partial-mash beer. The carbonation is great, the beer is a nice hazy pale, and the aroma is predominantly malt but with an earthy sweetness that I’m not familiar with. The taste is great – I’m actually surprised by the beer – for an extract beer it’s very clean and there’s not too much sweetness or anything. It’s really good – and there’s just something different about it that is intriguing. I’ve never had avocado leaves in anything so I have nothing to compare it to. There’s not much hop to it, but I understand why. The leaves apparently came from a friend in Hawaii, and were steeped and added to the wort. It’s definitely a recipe worth brewing again. Published on April 3, 2012 in Homebrew. 4 Comments Tags: bourbon, Homebrew, oak, porter. After 3 months sitting on bourbon soaked and toasted oak chips, I’ve kegged the remaining robust porter. It smells great and the sample I had while racking the beer suggests that it’s going to be a doozy. Stay tuned. 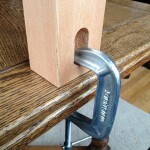 Published on April 1, 2012 in Beer Culture, Gear and Homebrew. 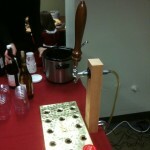 0 Comments Tags: Homebrew, keg, party, tap, tower, wedding. 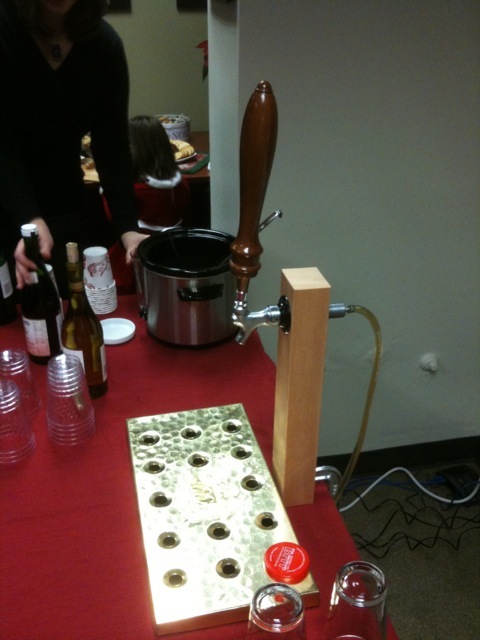 I built this banquet tap tower for Michelle’s office christmas party in December. 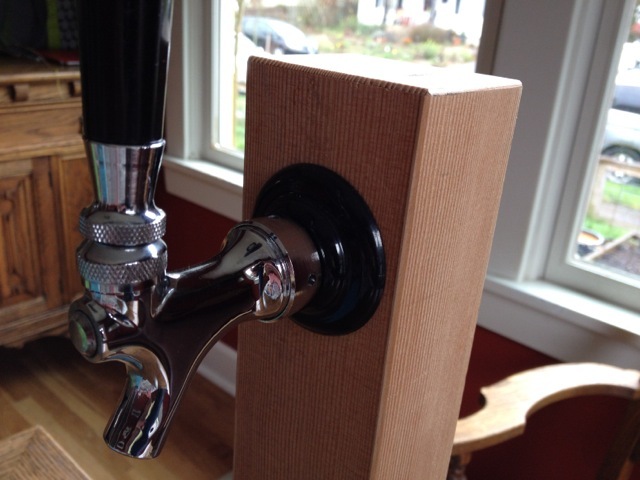 It’s a simple block of CVG Douglas fir with a hole straight-thru for a beer spigot and a partial groove in the bottom that allows it to be attached to a desktop with a C-clap. It started out as a part of a jockey-box, but after reading a fair amount, I decided that for the purposes of a party (or a wedding), the 5-gallon kegs usually get finished before they can cool down, and having the keg under the desk in a bucket of ice would be cheaper and less foamy than trying to get a jockey box dialed in. 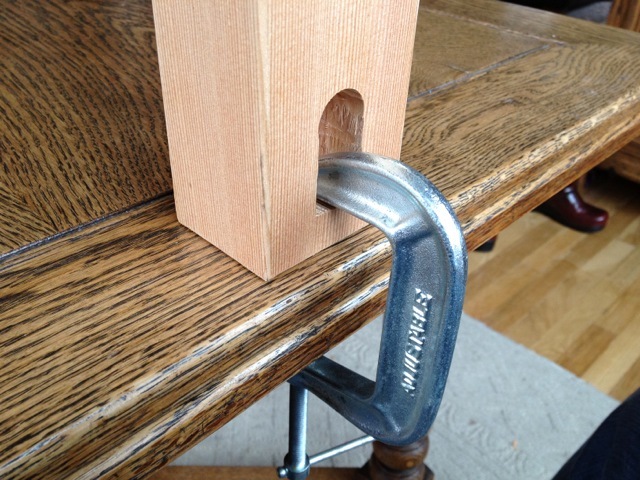 Anyway, it worked well, looked nice, and was fun to make with some scrap I had laying around. I re-sawed some of the CVG fir to glue to the sides so that it would be CVG all the way around. It seemed a shame to have only 2 pretty sides. I didn’t finish it – and I probably should given the wet nature of beer – but unfinished fir just looks so lovely. 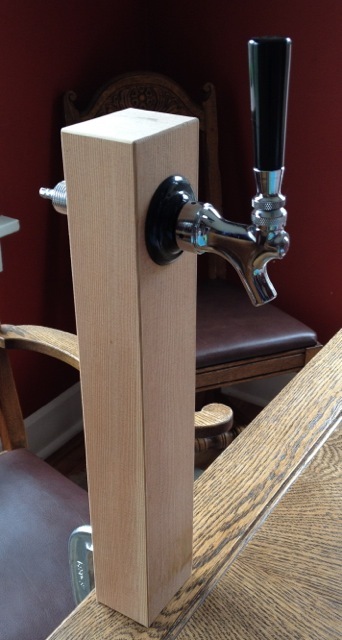 Personally, I like it better with the short tap-handle. Next step will be to make a matching handle. Published on December 29, 2011 in Uncategorized. 0 Comments Tags: holiday, Homebrew, porter. Last night I woke up sweaty, anxious, and my heart was racing. I wasn’t sure what I was forgetting, but I was given some productive night thought time. It wasn’t until tonight that I realized that last night I had tapped my robust espresso porter and consumed a pint and a half. It contains a fair amount of cold press coffee, and I’m susceptible to caffeine at night. So to those who get sweaty and nervous at night from caffeine, you might want to skip this one. It’s good though. Published on December 8, 2011 in Homebrew. 0 Comments Tags: coffee, cold-press, espresso, holiday, Homebrew, porter. This year’s holiday ale is based on a Robust Porter recipe, but one the two halves of the 10 gallons were halved, each faces a different fate. The first half was inoculated with my regular Fermentis dry ale yeast. It will be infused with cold-press espresso roast coffee during secondary, and will likely get quite a kick from it. The second half was pitched with Wyeast British Ale yeast, and will be put in to secondary with bourbon soaked oak chips. Both will have some pretty strong constituents, so I hope that this base recipe will be robust enough to support such big flavors. I’m still working out the details on how much coffee to add. 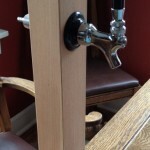 Talked to a brewer and have been reading about other home brewers’ experiences. Plus, there’s a lovely step-by-step to cold-press coffee on America’s Test Kitchen. As an FYI, the O.G was 1.062, and no less than 10 people stopped by to comment how good the the wort smelled. 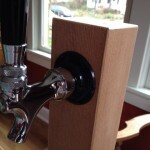 Published on September 15, 2011 in Beer Culture and Homebrew. 0 Comments Tags: Homebrew, potus. During this year’s Super Bowl, President Obama created a stir by offering guests at the White House beer that he’d brewed himself. And now the president reportedly plans to have another batch of his homebrew on hand March 17 — that’s right, for St. Patrick’s Day. Who would have known. From NPR News. 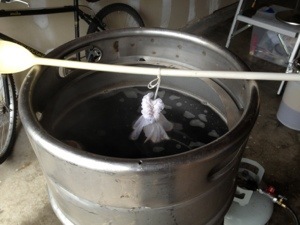 Published on May 28, 2011 in Homebrew and Recipe. 0 Comments Tags: Homebrew, ipa, jasmine, Recipe. Today I’m brewing a Jasmine IPA loosely based on Elysian’s Avatar. Avatar (the name greatly pre-date the movie hype) is one of my wife’s favorite beers, so I thought I’d give it a try. I picked up some jasmine via the web from a local reseller on Etsy. The bag arrived yesterday. I’m not entirely convinced by the experiment, and since this is a double batch (10 gallons), I’ll probably only do 5 gallons as the jasmine brew and the other as a dry hopped IPA using Simcoe hops. Here’s the base recipe. We’ll see if I go through with the split or just decide to do 10 gallons of Jasmine.